For many people, Miami is the perfect example of everything the state of Florida has to offer. Stunning scenery, an incredible skyline, almost endless sunshine, and beautiful sandy beaches make up this incredible city and have helped to make Miami one of the most visited areas, not just in Florida but in the entire United States. With such hot weather all year long, many Miami residents and visitors spend most of their time outdoors, taking in the sun and enjoying the open air with a wide variety of outdoor activities. Key Biscayne - This little island town in the Miami-Dade Country area is a super spot for kayaking. The town offers kayak rentals, as well as canoeing, kiteboarding, and other outdoor sports and activities. With a variety of ecosystems and an abundance of wildlife, kayaking at Key Biscayne is perfect for nature lovers. Oleta River State Park - The biggest urban park in all of Florida, Oleta River State Park is found at Biscayne Bay just off the coast of Miami and provides many different cycling and hiking trails, as well as the eponymous Oleta River for kayaking and canoeing. Kayak rentals are available at this park and the waters can range from quite calm to slightly choppy, so the park can appeal to kayakers of all ability levels. Coral Gables - Featuring several great kayak launch sites, Coral Gables is a great spot to start your Miami kayaking adventure. Head down to Matheson Hammock Park for kayak rentals and head off onto the waters of Biscayne Bay. Guided kayak tours are also available in this area and the warm waters tend to attract plenty of marine wildlife and wading birds. Various kayaking tours and kayak rental companies operate all around Miami and the surrounding area, making it easier than ever to enjoy Miami kayaking at all times of year. Whether you’re looking for relaxing kayaking experiences along the calmer waters of Miami or a more intense and challenging kayaking session, these kayaking companies can provide the services you need. 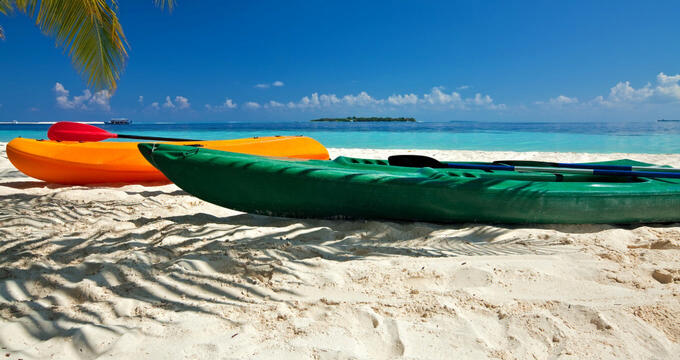 South Beach Kayak runs single and tandem kayak rentals at great value rates as well as paddleboard rentals too. Not only that, you can also sign up for 2-hour guided island kayak excursions. Led by friendly kayaking experts, these tours take you over to Monument Island Beach and through the nearby Venetian Islands, offering some stunning views and leaving you with memories that will last a lifetime, as well as the chance of seeing some local wildlife up close and personal. Virginia Key Outdoor Center is easily one of the best locations for outdoor enthusiasts and kayaking in Miami. Offering paddleboard, kayak, canoe, and bike rentals, as well as lessons, tours, and more, this Outdoor Center can help you experience Miami in ways you never imagined. Kayak fishing, kayak lessons, kayak rentals, and guided kayak tours are all available at the center, including night-time paddles, July 4th kayaking tours, manatee encounters, and more. There are even specialized kayaking lessons just for kids. Miami is well known for its stunning scenery and rich wildlife, and if you want to appreciate and enjoy these aspects of the city from the comfort of a kayak, Miami EcoAdventures is a great company to choose. This kayak operator runs canoe and kayak fishing tours, as well as snorkeling around Miami and, most importantly, a whole variety of guided kayak tours and adventures. These tours are designed to feature the very best views and wildlife encounters around Miami, taking kayakers around Biscayne Bay to Key Biscayne, Chapman Field, Matheson Mangrove, and other picturesque locations.